Social Action is central to our Temple's mission. We share the need to give in meaningful ways and we respond to the Jewish mandate to engage in tikkun olam, the repair of the world. We reach out to the world to help – and we stay close to home as well, helping members of our congregation who are in need. We visit each other when someone falls ill. We pray and grieve together when a death occurs. We are a small enough congregation to be intimate, yet big enough to make a collective difference in our community. SANDWICHES AT SINAI: Temple Sinai volunteers prepare bag lunches once a month for Be the Change - Sunday Meal an organization that provides a weekly meals for the needy at the West Warwick Senior Center. More hands are always welcome on preparation day, usually on the morning of the last Sunday of the month. Watch Rabbi Goldwasser's weekly announcements for upcoming dates and join in receiving an unvoiced "thank you" from grateful recipients. 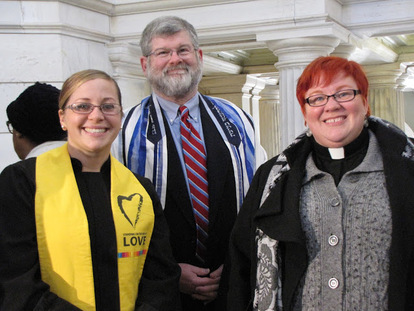 Rabbi Goldwasser works in coalition with other faith communities and faith leaders to advocate for social justice in Rhode Island. WARM CLOTHING COLLECTION: We start our warm clothing collection at the Interfaith Thanksgiving Service on the Sunday before Thanksgiving and continue with distribution to those in need throughout the season. Look for the collection boxes in the upstairs and downstairs lobbies. FOOD COLLECTION: Food collection for distribution to West Bay Food Pantries is ongoing through the year. Food collection boxes are in our lobbies. STATEWIDE ADVOCACY: Temple Sinai participates in statewide campaigns by faith organizations to end poverty, improve relations between police and the communities they serve, and to pass sensible domestic violence legislation. Rabbi Goldwasser works with congregational Social Action committees and with clergy of all faiths to advocate for justice in the Ocean State. "Prayer is Not Enough" is Temple Sinai's action network for congregants who would like to receive notices about specific things they can do to support Israel, reduce poverty, defend civil ​​rights, protect the environment, ​and repair our world. Notices include information ​on upcoming events, bills in Congress and the Rhode Island General Assembly, and learning opportunities on social action issues. Bob Haiken is the chair of the Social Action Committee. If you would like to be a part of the committee, attend meetings, or just make suggestions, please contact him. Hunger? Poverty? Disaster Relief? Is there a Social Action initiative you would like to see Temple Sinai participate in? Let us know. Put "Temple Sinai Social Action" in the subject line and email the committee at info@templesinairi.org.